In parts of the continent, monthly broadband packages cost more than national minimum wage. 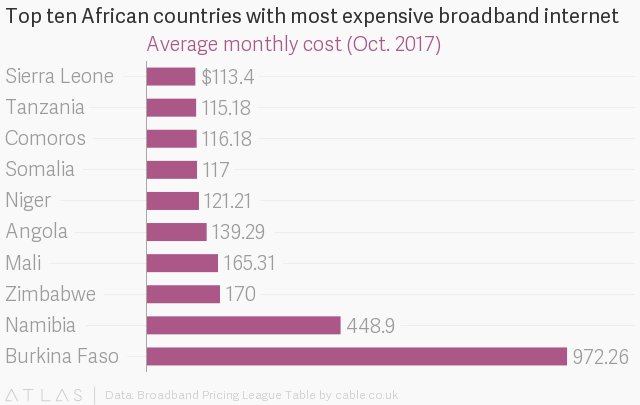 In Nigeria, for example, the $80 average cost of monthly broadband packages is nearly double the national minimum wage of $50 (18,000 naira), data from the broadband pricing league table compiled by Cable.co.uk show. 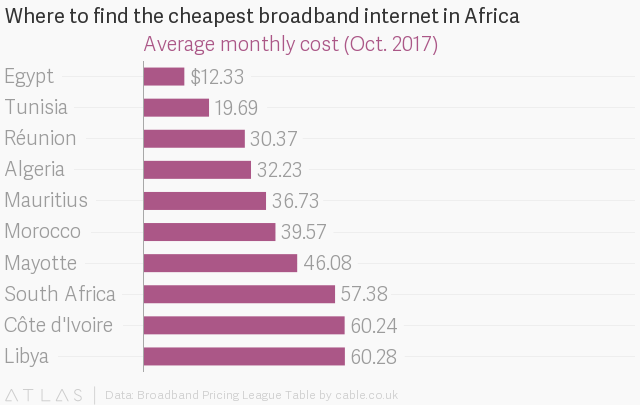 Of the 36 African countries analyzed, only seven countries had monthly broadband packages cheaper than $50. The pricing table was compiled and analyzed by Cable.co.uk using the cost of over 3,000 individual broadband packages globally in an eight-week period between August and October. The global prices were gathered by BDRC Continental, a research consultancy in the UK. 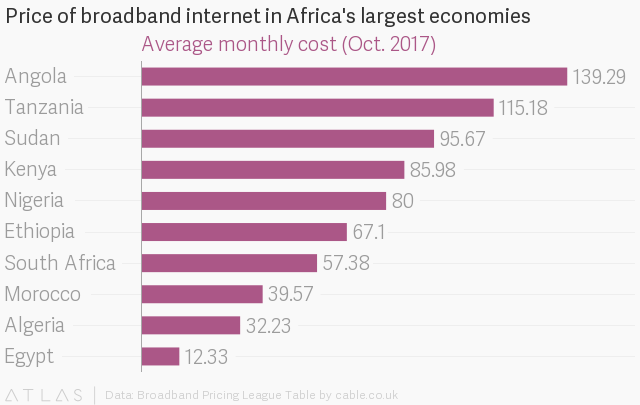 Being on the coast works well for internet access and lower costs: all of the top ten African countries with the cheapest packages in Africa are coastal countries. An explanation for that is that proximity to cable landing stations remains a crucial hurdle to internet access in most landlocked countries in Africa. As such, internet access prices are likely driven up given the added infrastructural costs incurred by the provider. Even in coastal nations, rural areas far from the coast often face a similar problem. Like the costs, internet speed still remains a worrying problem as much of the continent still experiences speeds below the global minimum standard. None of the 39 African countries ranked in a global broadband speed league in August achieved average speeds deemed to be the minimum speed (10 megabits per second) required by consumers by UK’s telecoms regular, Ofcom. While research for the pricing table focuses on fixed line broadband, mobile internet connections are proving far more popular in Africa, largely thanks to increasing smartphone adoption. In fact, mobile internet prices are dropping in some countries and it’s not strange to see young people exploit cheap mobile internet plans by using their smartphones as hot-spots to get connected via computers. But for large organizations, like schools, businesses and government agencies, which require tens or hundreds of people to be online at the same time, mobile internet plans can’t serve as well. As such, despite the smartphone and mobile internet explosion, in some cases, broadband internet is still important to serve as a more efficient and cost-effective way to get online. Burkina Faso props up the global pricing table with average monthly costs pegged at $973—15 times the monthly minimum wage. Three other African countries, Angola, Zimbabwe and Namibia, are included in the global bottom ten.